My free pumpkin. Partway through my pumpkin abattoir. 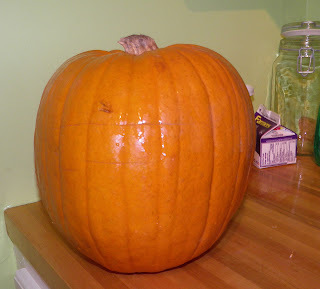 I told all my Facebook friends on Saturday that one of the local grocery stores was giving away pumpkins. Yes, giving them away. The other major grocer had them on sale for 50¢ – a far cry from the $4.99 they were asking on October 31. I guess they over-estimated the consumer appetite for Jack ‘O Lanterns this Halloween. Did I say it was free? Their loss…our gain. How on earth can anyone turn down free food? You’d have to be crazy. Especially free food that’s so good for you. We don’t eat enough pumpkin, be it fresh or canned. I should clarify what I mean by “pumpkin.” I’m talking about the big, round orange ones. In many parts of the world “pumpkin” encompasses all winter gourds, including pumpkins and squash. The two are close relatives and have a similar taste. Often recipes for pumpkin pie suggest using what we call squash instead of pumpkin. It sometimes has a more “pumpkin-y” flavour. Pumpkin (including squash) is incredibly rich in antioxidants and vitamins. It is low in calories, contains Vitamins A, B, C and E, and carotene, lutien and xanthin (antioxidants) in high quantity. It’s one of the most common field crops grown for commercial sale. A 100 g serving of pumpkin contains 246% of your recommended daily amount of vitamin A. This vitamin is essential for maintaining eyesight. 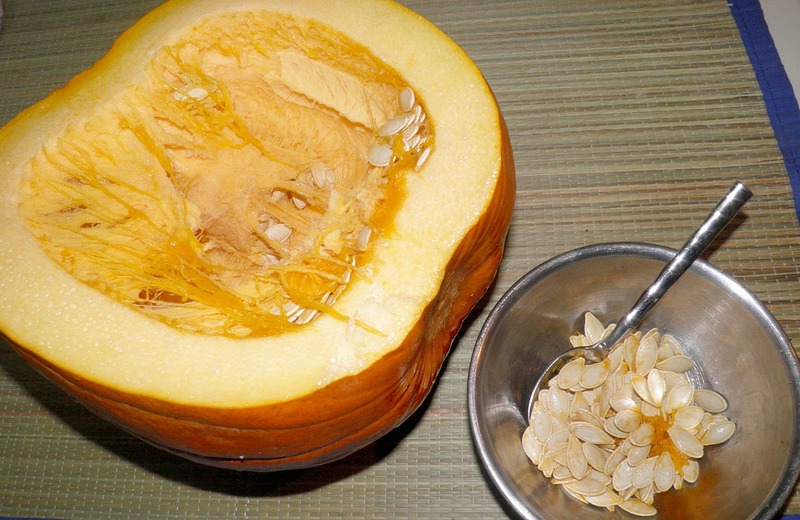 The health benefits of pumpkin is being studied more and more. Recent research suggest xanthin may slow macular degeneration in the elderly. 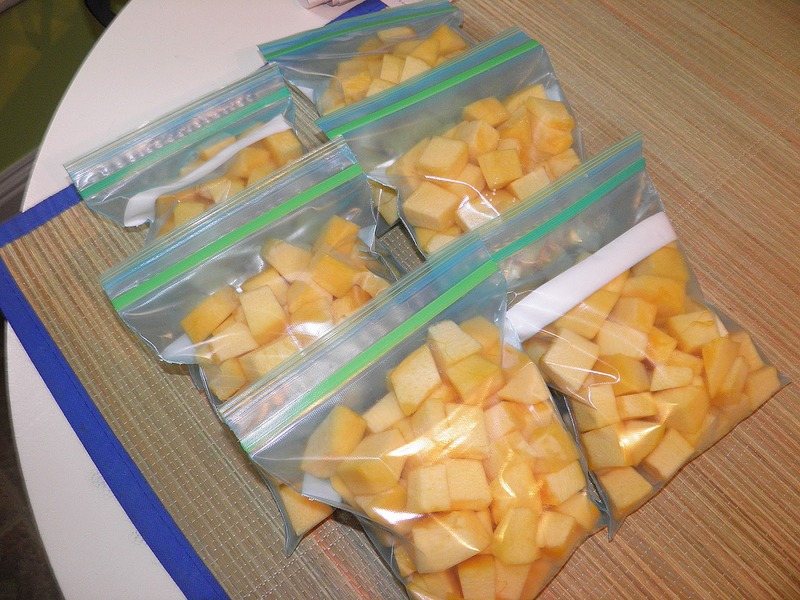 Pumpkin also contains healthy doses of copper, calcium, potassium and phosphorous. my bread bowl. It is fairly large. 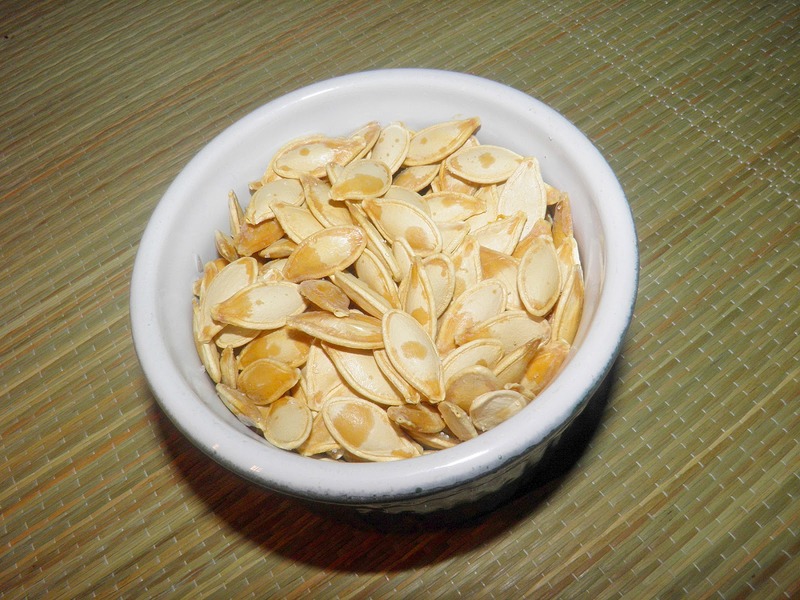 Pumpkin seeds (pepitas) are an excellent source of dietary fiber and monounsaturated fatty acids. The seeds are good sources of protein, minerals and vitamins. They are also an excellent source of the amino acid tryptophan that helps maintain brain health. So I picked up a pumpkin – not too big, but not too small either. It would be a pretty stupid post if I hadn't, right? Once it was in the car a sense of dread overcame me. What would any sane person do with all that pumpkin? Well the short answer is you can freeze it. Yes – no parboiling, baking steaming or processing of any kind. Just peel it, cut it up, bag it and throw it in your freezer. I divided up my yield into six zip-lock bags. It did take a little while to reduce the thing down to a pile of cubes, but it will be worth it. It also didn't take me long to think of a recipe to use some up. I have "pumpkin pie" frozen yogurt now sitting in my freezer (recipe in a few days) and another unfrozen bag destined for something else this week. 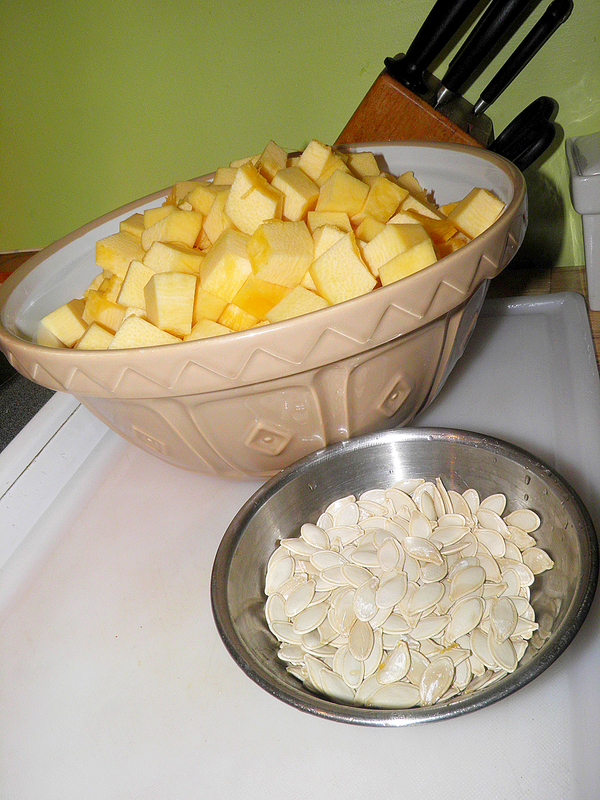 If you expand your pumpkin repertoire past desserts the world actually opens up quite wide for you. Lots of countries make fantastic savoury dishes with pumpkin. Besides the six bags of pumpkin I was able to get about one cup of pepitas. Roasting them proved to be insanely easy. Pepita is the Spanish culinary term for pumpkin seed. They are used quite a lot in Mexican and Latin cuisines, either whole, chopped or ground, and are quite a tasty snack just on their own. Nutritionally, besides what I said above, the seeds are a good source of protein as well as many important minerals. For example, 25 grams of pepitas have 20% of our recommended daily amount of iron. The trick is to roast them long enough to make the husk crispy and chewable without burning the inside. It’s a somewhat dedicate line to walk. Somehow I managed to do it. If you did get a pumpkin, or are inspired to get one now—they’re probably on sale everywhere—don’t throw away the seeds! They're sort of like a bonus on top of all the nutritional pumpkin flesh. The seeds will start to colour somewhat when they're ready. Remove the seeds from the pumpkin. Wash under running water taking care to remove any pumpkin flesh that clings to them. Pat them dry or let them air dry. Cover the bottom of a cookie sheet with aluminum foil. 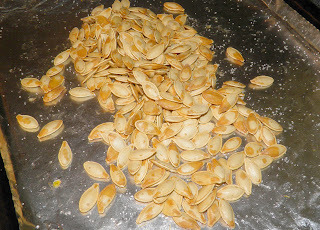 Toss the washed seeds with vegetable oil and salt. Spread in a single layer on the foil. Roast at 300°F for 30 minutes, checking at 15 min and every 5 minutes thereafter. Taste one at each interval. The shells must be crunchy but make sure the seed inside doesn’t burn. Stop baking them when you’re happy with their crunch. If you like this post feel free to share it using any of the links. If you repost, please give me credit and a link back to this site. Questions? Comments? Derogatory remarks? Just ask! Have you considered a soup? For me there are few things so delicious as creamed pumpkin soup with coconut milk for added tang!